Do sled dogs ever get tired? For more than a decade, veterinarian Mike Davis of the University of Oklahoma has been traveling to Alaska to study the physiology of what many consider to be the world’s greatest endurance athletes —sled dogs. Specifically, Dr. Davis tracks the Alaskan huskies of the Iditarod Dog Sled Race as they race across 1,000 miles of frozen sea and tundra, running an average of eight miles per hour for more than 100 miles per day, eating 12,000 calories per day and expending four times the energy that Lance Armstrong reportedly burned during the Tour de France bicycle competition. Davis wants to know — how do they do it? According to Davis, who has been extracting a mountain of data from Iditarod dogs since 2001, the most striking feature of these canines is their ability to rapidly adapt to sustained strenuous exercise. During their first hard day of running, conditioned dogs display most of the metabolic changes that are found in human endurance athletes — depletion of muscle energy reserves, increased stress hormones, evidence of cellular breakdown in proteins, lipids and DNA, and oxidative stress. In subsequent consecutive days of exercise at the same intensity, however, these breakdowns reverse. Within four days after exercise begins, the metabolic profile of the dogs returns to where it was before the race began — despite sustained, strenuous exercise. Finding a trigger to that change is Davis’s big question, and also the one that could have important applications for human endurance athletes. One theory centers on sled dogs’ impressive metabolism. These 60-pound animals can put away 12,000 calories per day during the Iditarod; human athletes, weighing two to three times as much, struggle to consume more than 5,000 calories a day. As a result, human athletes often lose large amounts of fat and protein stores during long efforts. Davis speculated that dogs are able to process this massive amount of energy through “transporters,” proteins that pull carbohydrates and fat directly into muscle cells. 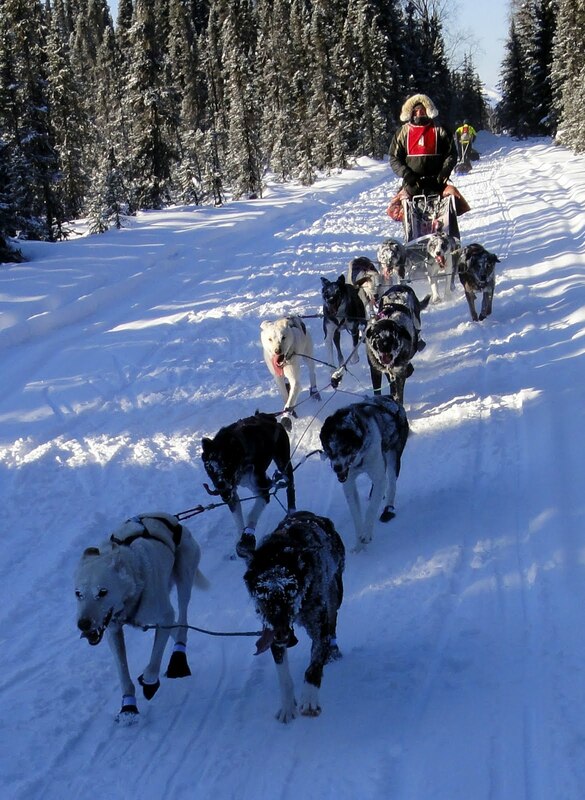 Research showed that sled dog muscle cells are crammed with mitochondria, the energy-producing units. Dogs have about 70 percent more of them per cell than humans have. The efficiency with which they can convert fuel allows them to extract a larger percentage of their energy from fat, which is much more energy dense and burns “cooler” than carbohydrates. Human muscle relies primarily on glucose, a carbohydrate that’s stored in muscles as glycogen, and burns hot and fast compared to fat. Humans’ fast-twitch muscles are able tap glycogen reserves in an anaerobic environment — without oxygen — which works well because humans’ systems can’t deliver as much oxygen to muscle cells. Racing sled dogs, on the other hand, have enormous aerobic capacity. While untrained sled dogs have an average aerobic capacity of 175 ml/kg/min VO2max (ratio of volume of oxygen to body weight per minute), the aerobic capacity of a fully conditioned sled dog is estimated to be about twice that (300). The highest documented VO2max for Lance Armstrong was a mere 84. Elite female endurance athletes rarely exceed 60 to 70 VO2max. In this relatively oxygen-starved environment, humans need quick-burning glucose, which burns hot and leaves a byproduct that “overflows” as lactic acid, breaking us down. Dogs, on the other hand, are extremely energy efficient. Davis’s studies zeroed in on the movement of fatty acids and glucose through the bloodstream, in an effort to observe changes in transporters on cell membranes. The experiments aimed to locate the specific pathway that can be manipulated to determine the exact mechanism of the sled dogs’ adaptation to strenuous exercise. Davis’s studies showed that dogs rebuild their glycogen stores on the run, thereby maintaining the energy flow and avoiding the “crater.” It’s likely, he speculated, that they manage this by somehow switching much of the fuel they use from glucose to fat. By directly burning fat — meaning they somehow do so without converting fat to glycogen first — they avoid cell burnout, lactic-acid buildup, and long-term depletion of stored glycogen. Davis didn’t know how dogs made this switch, and could only speculate that the ability must be within their genetic control. The question remains: Do humans — who, like dogs, evolved with a high capacity for long-distance endurance — also possess these abilities in their genes? After reading up on Davis’s studies, I’m still left to wonder something I’ve wondered ever since I started dabbling in endurance sports — are humans more like sled dogs than we even know? Is it possible that we can cross that secret line between breaking down irrevocably, and getting stronger as we go? Davis’s research, which has since picked up funding from the Pentagon and moved on to military applications, has only brushed the surface so far in the effort to determine why Iditarod dogs can do what they can do. A single breed of a single species can’t possibly be that genetically specialized, can they? Maybe there is something there that is more difficult to study in dogs — changes in their psyche, perhaps — that spur the metabolic modifications in their cells. It’s also an interesting study to consider now that fat burning has become all the rage, with Paleo and other low-carb diets in vogue. Sled dogs are usually fed high-fat diets because this food is cheaper (think chum salmon hoosh) and more calorie dense (therefore lighter to carry in a sled) than grain-based dog foods. Most mushers concur that there’s little evidence that dogs perform better on hoosh than they do on dog food. So is fat really the key? It would probably be a really interesting study for Davis to take a group of Paleo humans and have them run 1,000 miles on the Iditarod Trail. There are humans that can run 1,000 miles on the Iditarod Trail, of course. They are slower and more methodical than the dogs, but they get the job done without “cratering” as a result of their efforts. Do these people have it all figured out, or are they just expressing a latent human ability that so few humans try to express? It’s interesting to consider, even if the question of just how far humans can take their own endurance isn’t readily answerable. Maybe Beat is part sled dog. There’s a show on TV called “Superhumans” where the host searches the world over for people who can do super-human things. One of these guys apparently had this ability. Can’t remember his name, but he’s famous world over for being able to run harder the longer he goes. They put him on a treadmill and hooked him up to all sorts of stuff, including taking a lactic acid test every few minutes…as the effort got harder he hit a point and then the lactic acid in his blood started to drop, despite his effort being harder. He can just go and go seemingly without end at a quite high pace…the Dr’s couldnt’ explain it. Maybe we all have this capability within us, the trick is to get it working. 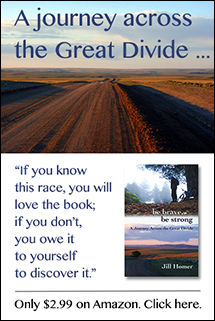 I think back to Jill’s GDR event and I think that you were tapping into something similar to accomplish what you did. I’d think that most ultra-endurance athletes do the same. After the first day or 2 of sustained effort your body shifts how it does business, much like the sled dogs. Great post Jill! Mitochondrial membranes have long been the elusive dream of bioengineers. If we could mimic what it does no oil would ever be needed. There is a price for everything though. Dogs get 10 years of battery recharging genetically programmed, we slow humans get 80. That’s why we have evolved to think about sled dogs while they just run.